Can't Find a Bookmark: Simon & Schuster's Big Fat YA Giveaway! Hey guys! Kathryn McKenna the Children’s Marketing & Publicity Assistant for Simon and Schuster UK dropped by at The Book Smugglers to share some exciting new books set to be released in July-December 2010! Not only is she giving us a sneak peak at these wonderful new titles, but one lucky winner will get all eight books! How exciting is that?! Titles include: Passing Strange by Daniel Waters, The Night of the Solstice by L.J. Smith, Shade by Jeri Smith-Ready, 2 republished Buffy books, Crescendo by Becca Fitzpatrick, and The Replacement by Brenna Yovanoff! 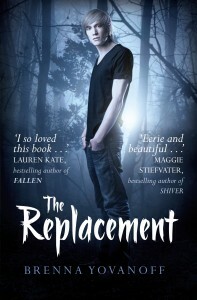 And of course I just had to throw in The Replacement UK cover! I cannot WAIT for this book!!! *jumps up and down* Be sure to stop on by and check it out!